On Tuesday 11th March saw the return of the Interiors Design Summit, an invitation only event where architects, interior designers as well as other industry professions come together for a day of meeting suppliers who are seeking new solutions as well as attend the series of CPD talks. This year the opening keynote speaker was SBID President, Vanessa Brady. Following Vanessa were two CPD talks given by SBID partner members, Karen Haller and Johnny Grey. Here is an overview of each of their talks. The science of colour psychology, not be confused with colour symbolism or colour association, identifies and strategically applies the role of colour to influence mood, behaviour and positive interaction. Our reaction is largely unconscious; however colour is the first thing people notice whether that is a product or an interior. My CPD talk focused on business and publically accessed spaces and how, by harnessing the power of colour, it can become a powerful sales tool in the customer facing area and a powerful tool to support a productive happy, more motivated work force. SBID partner member Karen giving her CPD talk. Colour is a very powerful phenomenon that is used to influence us every day of our lives. It influences our behaviour and feelings, making us move more quickly, feel more relaxed, eat more and spend more. As human beings it’s in our nature to feel and respond to harmony and balance. Colours are not seen in isolation. So when we experience overwhelming, clashing or jarring colour schemes, particularly over time, it causes stress, dis-comfort and dis-ease and all of the business implications related to those issues. A workplace overwhelmed with colour can be as detrimental as one lacking in colour. It’s not about using colour for colours sake, as mere decoration or an afterthought. It’s about using the right combination of tones with purpose and intent. After all, supported and healthy staff equals profitable business. 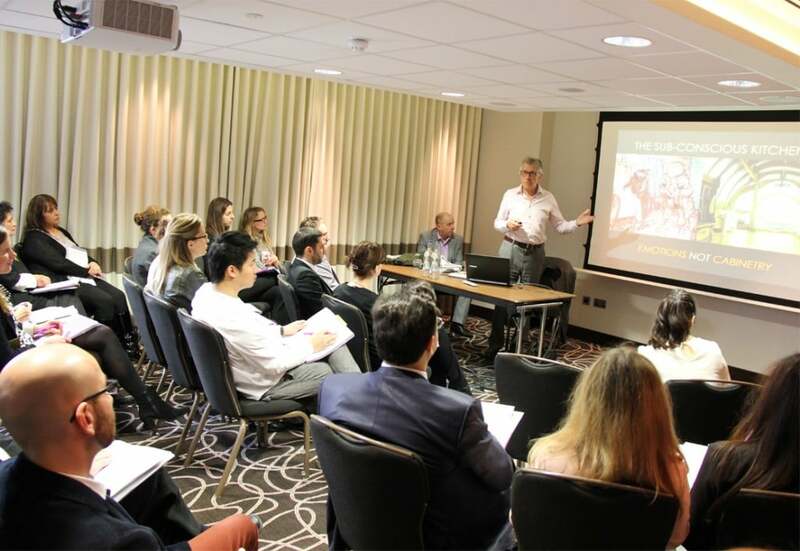 This was my second year speaking at the Interior Design Summit as part of their CPD programme. It was great to see this event well attended and once again the most delicious lunch feast with the buzz of networking and connections being made. SBID partner members Karen Haller and Johnny Grey chatting with one of the delegates. Blum sponsored me to talk about my Long Kitchen concept at the Interior Design Summit on March 11 – a chance to air new ideas about creating kitchens with the emotional durability to last for upwards of 30 years. Perhaps as a result of the financial crisis there is growing interest in multi-generational living. Newcastle University’s Changing Age Initiative is developing a programme to help the kitchen industry develop new products for an aging population, and I coined the phrase the ‘Long Kitchen’ to incorporate research into designs for kitchens to suit both older people with certain kinds of physical impairment (without making the spaces look like institutionalised kitchens for the disabled) and at the same time allow use by families with children. Design solutions for this include flexible free-standing furniture, dedicated work surfaces, different-height worktops that encourage sociability, soft geometry for easy circulation, freestanding appliances for easy replacement and lots of places to perch. Older citizens like to sit whilst they prepare food. SBID partner member Johnny Grey giving his CPD talk. Sadly, I ran out of time with my talk and was unable to take questions. If anyone would like to discuss a project along these lines here or abroad, please contact my studio on 01730 821042. For further information on the upcoming kitchen design course at Bucks New University, contact Julie Catlow on 01494 603153. A part of the CPD programme, this event attracted excellent participants and offered a well laid-out networking lunch. My preserved beetroot salmon was great and the puddings were super-stylish! If you would like to use any content in this blog post please seek permission of the originating author.